Jordy Nelson with his teammates in a training camp practice. 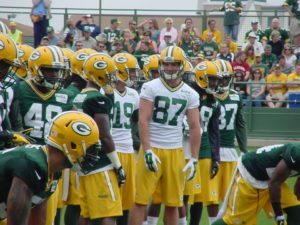 One year after his release by the Green Bay Packers, wide receiver Jordy Nelson is retiring. Former Packer James Jones first reported the News in a tweet on Wednesday. Jones is a contributor to the NFL Network. In his 10 seasons with the Packers, Nelson caught 550 passes for 7,848 yards and 69 touchdowns. His best season came in 2014 when he caught 98 passes for a single-season franchise-record 1,519 yards and 13 touchdowns. He garnered second-team All-Pro honors in the process. Nelson tore his ACL in a 2015 preseason game, then won the NFL’s Comeback Player of the Year Award in 2016. But Nelson was asked to take a pay cut in 2017 and when he didn’t, the Packers released him. Nelson spent last season with the Oakland Raiders, catching 63 passes for 739 yards and three touchdowns. The Raiders then released him earlier this month. With Nelson’s retirement, he ranks third in career receptions with the Packers, fifth in yards and second in touchdowns. He’ll be a shoe-in for the team’s Hall of Fame when he’s eligible.